The shopping experience in the Kohuwala area is scaling new heights following the opening of a new environmentally friendly hypermarket in the heart of the suburb by Arpico. 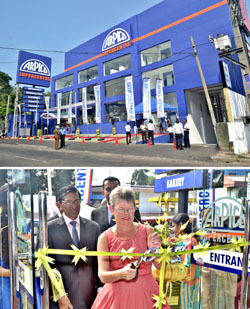 The Arpico Supercentre at 89, S. De S. Jayasinghe Mawatha, Kohuwala is the 20th hypermarket owned by the retail giant and offers 25,000 square feet of shopping space for the customary panoramic product range synonymous with Arpico Supercentres elsewhere. The purpose-designed building’s eco-friendly credentials make it one of the ‘greenest’ supermarket outlets in Sri Lanka. It accommodates over 40,000 products including fast-moving consumer goods, fresh produce, household items, electronics and furniture under one roof, offering shoppers unmatched variety and brand choice.